The taiga or boreal forest has been my favorite biome so far. The variety of animal life within these forests is amazing! Much of the variety is due to migratory patterns of birds and other wildlife. We spent some time studying migration as we read about the wildlife in these forests. My son, four years ago, on the timber wolf statue in my parents’ back yard. Life in the Boreal Forest by Brenda Z. Guiberson was a quick read and a great introduction to the biome. We loved the illustrations and the many interesting animals it introduced. Ecosystems: Boreal Forests by Patricia Miller-Schroeder was more in depth than our first book. We read and studied portions of the book. For older children, this would be a great place to start. Forest by Frank Howard offered a couple of pages on each type of forest. 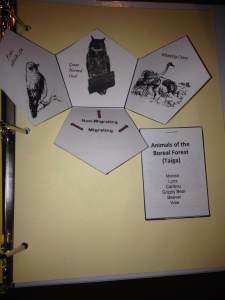 We reviewed our rain forest knowledge and got a hint of what is to come with our other studies. Look Inside a Beaver’s Lodge by Meagan Cooley Peterson gave us a fun look at the life of a beaver. A Moose’s World by Caroline Arnold went through the first year of life for a moose. Angry Birds: Playground: Animals: An Around the World Habitat Adventure by Jill Esbaum covered more than just our taiga animals. My son found it and has made it his extra reading. We plan to hang on to it through the rest of our study.The Angry Birds characters introduce you to animals in a variety of habitats. Why Do Birds Fly South? another Weekly Reader ‘Just Ask’ book we had at home provided a good explanation of migration. We found that many birds of the taiga are migratory, so we added a short study of migration to this area of our study. Non-Migratory – Moose, Beaver, Snowshoe Hare, Brown Bear, Lynx, Wolves, Voles, Great Horned Owl, Red Fox, Ermine, Timber Wolves, Grizzly Bears, and the Stone Centipede. Boreal means northern, after the Greek god of the North – Boreas. The boreal forest covers approximately 50 million acres. Our lapbook entries covered migratory and non-migratory birds, deciduous and evergreen trees, animals, photosynthesis, and migration. Cheryl– Cheryl is a singing, dancing, baking, homeschooling mom of three. She has danced her whole life and taught ballet and theatre for most of her adult life. Her favorite pastime has always been cooking and baking, and as a Pampered Chef Independent Consultant she gets to share that love with others. Home educating her three children has been and continues to be one of her greatest learning experiences! It is an adventure she is ready to continue. Next Healing Modern Warriors Through the Past, by Jen W.